IPSWICH, Mass. 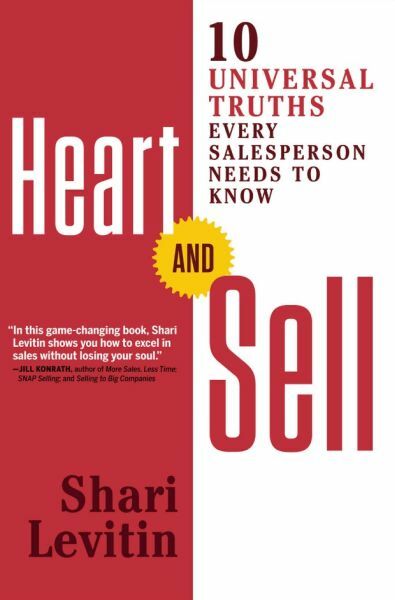 - Aug. 18, 2017 - PRLog -- In Heart and Sell, Shari Levitin provides a blueprint for both new and seasoned salespeople for fostering meaningful interactions with prospective customers that translate into sales. Levitin believes that salespeople must explore their own motivations and values so they can understand customers' wants and needs. Good salespeople embody integrity, reliability, and competency. A great sales pitch is not about saying the right things but rather listening to the customer and demonstrating how the product addresses the customer's concerns. *Putting one's heart into the business of sales means living in an ethical and principled manner. *Good salespeople are not manipulative. They exhibit integrity, and customers instinctively trust them. • Salespeople selling the same things can have very different results, based on their interpersonal style and self-awareness. • Effective salespeople are able to connect with and empathize with others and understand customers' goals and dreams. • People's buying habits are based on emotional considerations, not economic concerns. Zeroing in on practicalities like pricing is seldom effective for winning over prospective customers.